It’s been awhile since I’ve written about one of my all-time favorite topics in food: cheese. While I may frequently tweet about my favorite cheese derivative, cheezits, or even add new entries to my cheese list on occasion, I rarely find a cheese so notable as to dedicate an entire post to its magnificence. Get ready, because today is one of those days. Let’s be honest, everyone has a special place in their heart for slices of American cheese. Even the most prestigious chef in the country likely has some sort of fond childhood memory of coming home from school, putting a couple slices on a terrible piece of bread, heating it up in the microwave, and chowing down. Unfortunately, with age comes wisdom – the wisdom of knowing how overly processed and un-cheese-like American cheese really is; the wisdom to make the tough decisions in life and leave American cheese in the past. Luckily for me, Bi-Rite has saved me from a life without the taste of Kraft singles by helping me discover Beemster Graskaas, a young Gouda only available during this time of the year. While this Dutch company is better known for their more aged Goudas, such as their Vlaskaas, I find the rare Graskaas, made with the cow's milk produced by eating spring grass, to be more impressive because of its unique characteristics. Unlike most aged Goudas, this cheese isn’t nutty, crystallized, or salty. In fact, it’s slightly sweet, but not really assertive in any definable way. There is no better way to describe its taste than saying that it is honestly just like a real slice of American cheese. The similarities are obvious: its orange hue resembles those Kraft singles but is less unnaturally neon in color; it has the same pliable texture, but rather sliced and individually packaged in plastic, it comes in a traditional, paraffin-dipped mountain wheel. And let’s not forget the most important similarity - its meltability. Few cheeses can rival the meltability of American cheese in a grilled cheese sandwich. 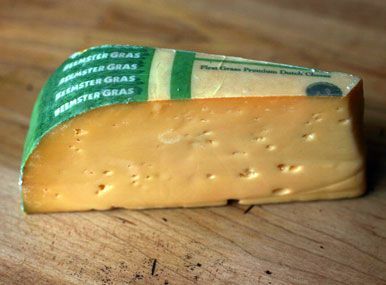 Graskaas not only matches American cheese’s meltability, it raises it by also being edible. I’m known by many as being a Grilled Cheese Master and, professionally speaking, I don’t think that I’ve ever made a better grilled cheese than yesterday's masterpiece, made by shaking up my classic recipe and adding Graskaas to the mix. It was so good that I immediately rushed over to Bi-Rite to pick up three more huge slices – basically enough to last me until next season. My advice: if you want to make the best grilled cheese sandwich of your life, get over to Bi-Rite ASAP and stock up. The Graskaas won’t be around for long. Did you number the quarters and eat them in ascending order? Thank you for this very informative post, Kelsey. I'm going to purchase some in the next few days. Kindest Regards, Michael. Great post. Yes, Graskaas is simply amazing cheese. I look forward to it every year and have been enjoying this amazing cheese for years. Make sure to give it the full hour to warm up. Try some on a burger and you will be in heaven, or crackers, or just eat it with your hands by itself hahaha. My all time favorite.